Fedora 26 was released July 11 and I have already upgraded several of my computers with it. My initial impressions are mainly very positive. This is not intended to be a complete or intensive review, just a quick record of my first encounters with it. I have successfully upgraded five of my eight hosts since yesterday morning. Of the ones that have not yet been upgraded, one, a very old and slow EeePC is still in process, I have not started one, and one encountered a problem during the upgrade. The successful upgrades were easy and even though one encountered a problem during the upgrade, restarting the upgrade after adding more space to /usr and /var resolved that problem. You do use LVM so you can do that, too, when required, don’t you? As for how it looks and works – most of the changes are under the hood and can’t be seen on the desktop. Except for the new default wallpapers, of course. One of those new wallpapers is an animated one of leafless trees on a blue and white wintry background that changes dark to light and back to dark as the day progresses. Some of the major under the cover changes are a new version of GCC, and new versions of Goolang and Python. Fedora 26 is distributed in three main options, Workstation, Server, and Atomic host. It also comes in several additional spins that are created and supported by special interest groups such as Fedora Labs, and the Python Classroom. This article is now available here, on this site. I recently upgraded a couple older computers with new processors that were faster and had more CPUs than the previous ones. I discovered that it was necessary to upgrade the motherboard BIOS before the new Intel processors would work. I don’t use or even have Windows so any upgrade procedures using that was a no-go from the start. Nor do I have an old version of DOS. I also wanted to perform this BIOS upgrade using open source software. Google helped me find my answer. I used FreeDOS to upgrade my system BIOS. Read about it here on Opensource.com. The EXT filesystem has been the default filesystem for many Linux distributions for many years. EXT2 was the first filesystem I encountered when I first started with Linux 20 years ago. It is robust and works well in almost every mainstream application environment. The EXT4 filesystem is the latest incarnation of this line of filesystems and brings even more speed and reliability to the table. My latest article at Opensource.com is an Introduction to the Linux EXT4 filesystem. It covers the history of Minix, the EXT predecessor, as well as the evolution of EXT to where it is today. Ever go into a store that sells computers and try to pick out a computer that will work with Linux? Short of reading a review that mentions Linux compatibility or finding a compatibility list – most of which are completely out of date – there is little real information out there on hardware compatibility with Linux. That is not to say that compatibility is a major problem these days because it certainly is not. Most computers will work just fine with Linux, but there are some bits of hardware that may still cause problems. Laptops tend to be more proprietary than desktop workstations, so testing them before you purchase is more of a necessity because they tend to use less compatible devices. My latest article on Opensource.com is about Testing Linux hardware compatibility with USB sticks. 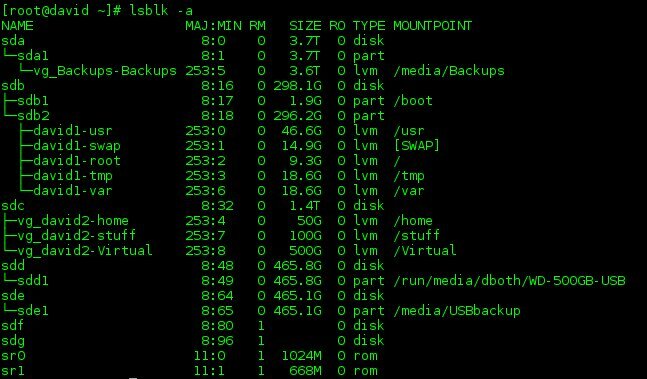 It shows you one method for creating a bootable Live USB stick that you can use to test computers in a retail store. My article gives you my experiences along with those of another intrepid tester here in Raleigh, NC, and some tips for in-store testing. My latest article Build your own DNS name server on Linux, has been posted on Opensource.com. This is the second article in my series on DNS name services. Published yesterday, April 6, Introduction to the Domain Name System (DNS), talks about how name services work on both the client and server side, and lists some of the more common DNS records and their uses. You may also be interested in some of my other articles about networking. The following list of articles are posted here, and may also be posted on Opensource.com. The following articles are currently posted only on Opensource.com as of April 7, 2017. My latest article, Introduction to the Domain Name System (DNS), has been posted on Opensource.com. This article talks about how name services work on both the client and server side, and lists some of the more common DNS records and their uses. The following articles are currently posted only on Opensource.com as of April 6, 2017. If you are using WordPress and have JetPack installed, do not under any circumstances install JetPack 4.8 at this time. JetPack 4.8 causes significant problems. It apparently prevents loading of all plugins and prevents the site from working. I reverted back to JetPack 4.7.1 which resolved the problem. I will post an update to this story when there is a fix available. In the previous few days I have transferred the DNS registration of this site to Google Domains and changed the name and URL for the site. So I think it only fitting that I also change the look of the site with a new WordPress theme. I also wanted to ensure that some of the wider code, system listings, tables, and graphics on various pages of this web site have enough page width to show up completely; that had been a problem and now seems to be resolved with this new theme. Please contact me if there are still issues with some listings – or if you just want to comment on the new theme. There are a couple reasons for this, but the primary one is that I like the name better. The old databook.bz name does not reflect the true character of this web site. The old databook.bz URL will get you here for a while longer, but once you are here and click on any DataBook link the new URL will be used. Be sure to change your bookmarks. There are a lot of really great articles this year. Enjoy! I just read an interesting article on Unixmen.com about some useful tools that are not widely known. All are interesting, and some are CLI while others are for a GUI environment. I particularly like two of the CLI tools, iptraf to monitor TCP/IP traffic on your computer, and lsblk to list information about all block devices attached to a computer; that would usually be disk drives of all types. I particularly like the tree view that lsblk displays of not just the drives, but also the partitions on the drives. Note that iptraf is now iptraf-ng in some distributions. The following output displays the list of disk drives, including DVD-ROM and USB drives, as well as the hard drives and their partitions. Typical output from the lsblk -a command. In this case several different disk types are shown. The information provided by the lsblk -a command as shown above contains data about hard drives and removable USB hard drives. It also shows removable CD-DVD/ROM drives, sr0 and sr1. Disks sda, sdb, and sdc are all three regular hard drives. The sdd and sde devices are attached USB removable drives. The man page contains detailed assistance for getting the most out of this command. See the article for more information about the other tools.